It is amazing to me how much my eating habits have changed. Actually, I should have started by saying-- It is amazing to me how much my eating habits have HAD to change. Regardless, the change is ongoing and for the better. Take, for instance, grilling and eating steak for dinner. So very different today. When I was growing up I was served beef regularly for breakfast, lunch and dinner. Have you ever heard of a "minute steak"? They were popular when I was young and often served for breakfast. My mom thought serving a hunk of beef for breakfast was a great way to start the day. When I think back, I am sure it was at least an 8 ounce serving. The average size of a steak is 8 to 12 ounces and you can certainly buy a T-bone steak which is much larger with a typical size of 20 ounces. When I was growing up the only cut of beef that was available in a smaller size was a Filet Mignon but was considered a luxury, not an everyday choice. If for convenience, because of the way they are packaged, or for a better buy, I pick up more than one steak we tend to grill an additonal steak for leftovers and then freeze the rest. 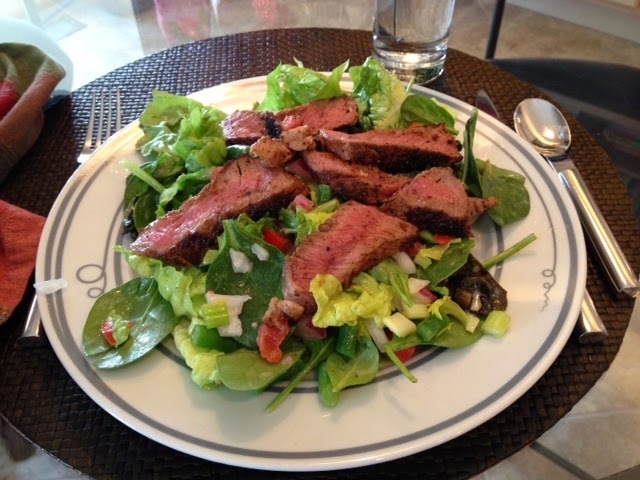 There is nothing better than thin slices of steak made into a plentiful steak salad the next day. Check out my blog for other leftover salad ideas. Hi Shelia, What material is your dinnerware made of? Love the the concept. New Food Labeling—A Disaster in the Making?